A compelling novel about Love, Betrayal, Oppression, Vengeance, and Hope. An adoring love story set against a repulsive political backdrop of tyranny, torture and murder. The musical presentation, an opera in three acts, follows the story of Juan Crisostomo Ibarra, who returns to the Philippines after pursuing scholarly studies in Europe. He plans to open up a school and marry Maria Clara, his betrothed. 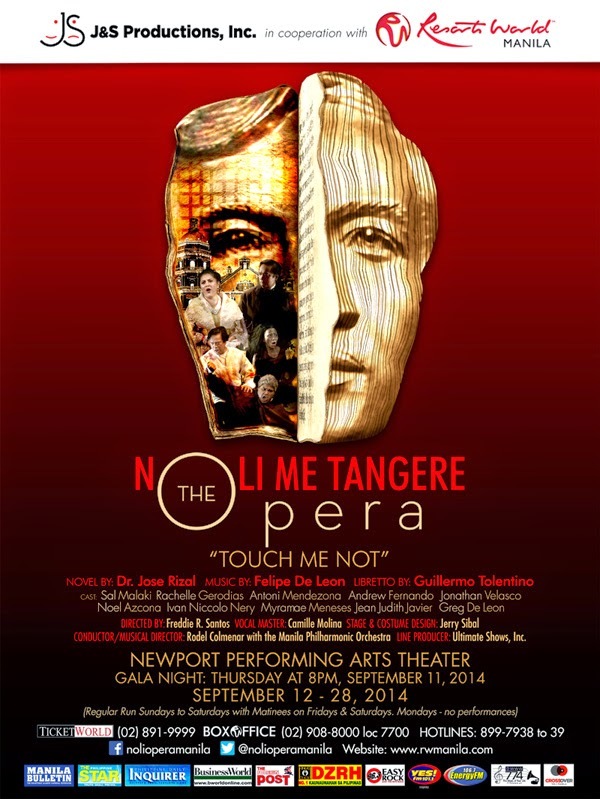 However, parish priest Padre Damaso, the archenemy of the Ibarras, is out to hinder Crisostomo’s plans, which creates “a dramatic storyline of forbidden love, betrayal and revenge.””Noli Me Tangere” (Touch Me Not) depicts the abuses suffered by the native Indios at the hands of Spanish tyrants. The opera paints us a clear picture of the so called “social cancer” that illustrates the rotten system of governance, the illicit ways of the church and the unfavorable trade of the privilege class.